Phil Bauer lives just outside of the historic gold mining town of Nevada City in the Sierra Foothills of California. He has been turning wood for 45 years in addition to making cabinets and furniture. A cement contractor in the San Francisco Bay area for 37 years, Phil retired in 1999. 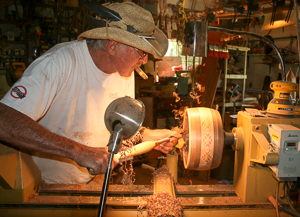 Today, when he is not playing golf or tending his vineyards, Phil can be found at his lathe turning beautiful segmented bowls, urns, cookie jars, chess pieces and game boards, in addition to a wide variety of objects made of exotic woods.